Email Marketing Or Social Media Marketing? Tips to help you decide. For the brands consulting a digital marketing agency for their marketing requirements, a common question is what services to avail and what to choose – social media marketing or email marketing. We get that question a lot and we thought why not list down the basic points that will make the decision easier? There are around 2.6 BN emailer users and 1.7 BN Facebook users. 91% people use email at least daily, whereas the percentage of people using Facebook daily is 11%. Email is the most preferred channel for promotional messages among 77% of the users. On the other hand, Facebook is preferred by 4%. Here are a few distinguishing factors between email marketing and social media marketing. 1. Social media is popular, yes. Everybody is on social media and you can talk to your third-cousin’s fiancé and your kindergarten teacher. However, email marketing has an individual targeting option. Sure, you can determine the market segment and you can pre-define the audience before you start the campaign, however, a lot of data is overlooked in it and there are a lot of unnecessary details. With Email marketing, you can target your present and potential customer one – on – one. Thus, it becomes more detailed. Apart from that, when compared to email, social media is newer and thus, email marketing has a larger database than social media. Twitter reach is around 30% – a lot more than Facebook but still considerably less than Email marketing. Here comes the importance of reach where email marketing definitely wins. 2. Most of the people have a habit of checking their mailbox at least once a day. A research has found that out of the people that they surveyed, 58% people’s first online check of the day is email; yes, hard to believe but true. Social media is first online thing to do only for 11% people. This might be the reason why email marketing has high click through rate compared to social media marketing. This also has higher conversion rate than social media. Open rate for email marketing is 16% whereas for social media marketing it is 0.07%! See the difference? 3. No matter how strong your social media followers base is; you need to keep in mind this fact – people’s attention span on social media is even lower than a goldfish. There are so many things to look at; your post will go unnoticed through the continuous scrolling. People are not on social media for a purpose, but on mail, they sure are. So even if people do not click on your CTA in the mailer, they will open the mail if the subject line is really enticing. 4. Everything in business finally boils down to money, and when that is the concern, emailers definitely take the lead. Email marketing is a lot cheaper compared to social media marketing. 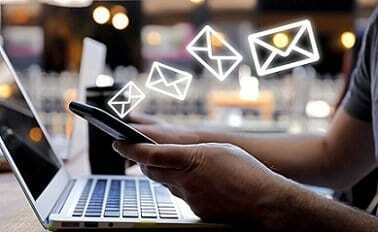 Considering the way Facebook is charging for ads and minting money, email marketing is a boon for digital marketing. I hope this post helps your understand the basic difference and what works the best out of two. If you need more information or you want to start social media marketing and email marketing, Write to us at collabs@theimpulsedigital.com or connect to us on Facebook / Twitter / or Instagram. I learned lot from your content. Thank you for sharing this vital information and tactics about SEO with us.